Gabrielle Union is a new mom. The actress disclosed this on Instagram. She took to the platform to announce that she and husband Dwyane Wade are parents to a baby girl. The child, whose name was not disclosed,was born November 7 via surrogate, the actress said. 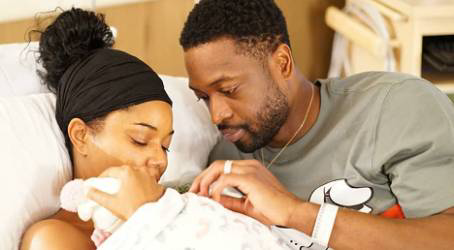 The "Being Mary Jane" star wrote she and Wade "are sleepless and delirious but so excited. ""11/7 will forever be etched in our hearts as the most loveliest of all the lovely days," she wrote. "Welcome to the party sweet girl! "Union and Wade have been married since 2014. This is their first child together. Wade has three children from previous relationships.